Preheat oven to 400 degrees. Place chicken in a sprayed baking dish and season with 2 teaspoons of BBQ rub. Spread sauce evenly over chicken and top with pineapple. Cover and bake for 30 minutes or until chicken is cooked throughout. Heat 2 tablespoon of coconut oil in a skillet over medium heat. Sauté garlic for 2-3 minutes or until fragrant. Add broccoli and cook 5-7 minutes or until broccoli is slightly tender. Add riced cauliflower and cook for an additional 10-12 minutes, stirring occasionally, until cauliflower is slightly tender. Season vegetables with 1 teaspoon BBQ rub, salt, and pepper. Each serving is 2 cups of sautéed vegetables with one piece of chicken and 1/4 cup pineapple. Equally drizzle remaining sauce from baking dish over each serving. *To rice cauliflower, place cauliflower florets in blender and pulse 5-6 times until they resemble rice. Alternately, you can look for riced cauliflower or cauliflower crumbles at the store. 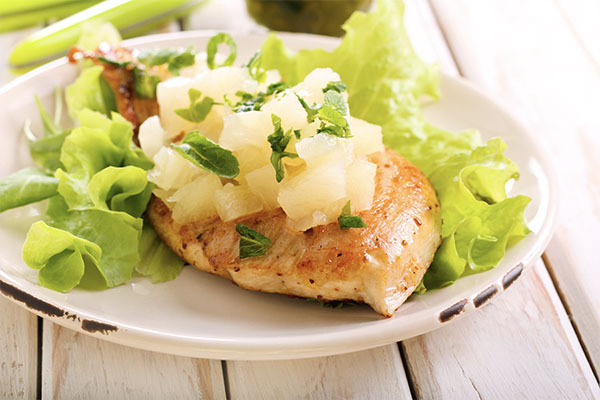 See the Leftover Hawaiian BBQ Pineapple Chicken Salad recipe in the Lunch Section of the meal plan to use leftovers.